The term cholangitis means inflammation of the bile ducts. The term applies to inflammation of any portion of the bile ducts, which carry bile from the liver to the gallbladder and intestine. The inflammation is produced by bacterial infection or sometimes other causes. Bile, which is needed for digestion, is produced in the liver and then enters the common bile duct (CBD) through the hepatic ducts. Bile enters the gallbladder between meals, when the muscle or sphincter that controls flow of bile between the CBD and intestine is closed. During this period, bile accumulates in the CBD; the pressure in the CBD rises, as would a pipe closed off at one end. The increase in pressure eventually causes the bile to flow into the gallbladder. During meals, the gallbladder contracts and the sphincter between the gallbladder and intestine relaxes, permitting bile to flow into the intestine and take part in digestion. Bile that has just been produced by the liver is sterile (free of bacteria). This is partly due to its antibacterial properties; these are produced by the immunoglobulins (antibodies) secreted in bile, the bile acids which inhibit bacterial growth themselves, and mucus. A small number of bacteria may be present in the bile ducts and gallbladder, getting there by moving backward from the intestine, which unlike the bile ducts, contains large numbers of bacteria. The normal flow of bile out of the ducts and into the intestine also helps keep too many organisms from multiplying. Bacteria also reach the bile ducts from the lymph tissue or from the blood stream. When the passage of bile out of the ducts is blocked, the few bacteria that are there rapidly reproduce. A partial blockage to the flow of bile can occur when a stone from the gallbladder blocks the duct, and also allows bacteria to flow back into the CBD, and creates ideal conditions for their growth. 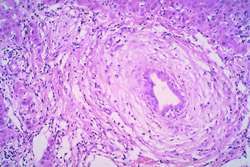 Tumors, on the other hand, cause a more complete blockage of bile flow, both in and out, so fewer infections occur. The reproducing organisms are often able to enter the bloodstream and infect multiple organs such as the liver and heart valves. Another source of inflammation of the bile ducts occurs in diseases of altered immunity, known as "autoimmune diseases." In these diseases, the body fails to recognize certain cells as part of its normal composition. The body thinks these cells are foreign and produces antibodies to fight them off, just as it fights against bacteria and viruses. Primary sclerosing cholangitis is a typical example of an autoimmune disease involving the bile ducts. As noted above, the two things that are needed for cholangitis to occur are: 1) obstruction to bile flow, and 2) presence of bacteria within the bile ducts. The most common cause of cholangitis is infection of the bile ducts due to blockage by a gallstone. Strictures (portions of ducts that have become narrow) also function in the same way. Strictures may be due to congenital (birth) abnormalities of the bile ducts, form as a result of injury to the bile duct (such as surgery, trauma), or result from inflammation that leads to scar tissue and narrowing. The bacterium most commonly associated with infection of the bile ducts is Escherichia coli (E. coli) which is a normal inhabitant of the intestine. In some cases, more than one type of bacteria is involved. Patients with AIDS can develop infection of narrowed bile ducts with unusual organisms such as Cryptosporidium and others. The three symptoms present in about 70% of patients with cholangitis are abdominal pain, fever, and jaundice. Some patients only have chills and fever with minimal abdominal symptoms. Jaundice or yellow discoloration of the skin and eyes occurs in about 80% of patients. The color change is due to bile pigments that accumulate in the blood and eventually in the skin and eyes. Inflammation due to the autoimmune disease primary sclerosing cholangitis leads to multiple areas of narrowing and eventual infection. Tumors can block the bile duct and also cause cholangitis, but as noted, infection is relatively infrequent; in fact cholangitis occurs in only about one in six patients with tumors. Another type of bile duct infection occurs mainly in Southeast Asia and is known as recurrent pyogenic cholangitis or Oriental cholangitis. It has also been identified in Asians immigrating to North America. Most patients have stones in the bile ducts and/or gallbladder, and many cases are associated with the presence of parasites within the ducts. The role of parasites in causing infection is not clear. Many researchers believe that they are just coincidental, and have nothing to do with the stones or infection. The above symptoms alone are very suggestive of cholangitis; however, it is important to determine the exact cause and site of possible obstruction. This is because attacks are likely to recur, and different causes require different treatments. For example, the treatment of cholangitis due to a stone in the CBD is different from that due to bile duct strictures. An elevated white blood count suggests infection, but may be normal in 20% of patients. Abnormal or elevated tests of liver function, such as bilirubin and others are also frequently present. The specific bacteria is sometimes identified from blood cultures. A number of x-ray techniques can make the diagnosis of bile duct obstruction; these include ultrasound and computed tomography scans (CT scans). However, ultrasound often cannot tell if an obstruction is due to a stricture or stone, missing a stone in about half the cases. CT scans have an even poorer record of stone detection. Another method of diagnosing and sometimes treating the cause of bile duct obstruction or narrowing is called percutaneous transhepatic cholangiography. In this procedure, dye is injected into the ducts by means of a needle placed into the liver. It is also used to drain bile and relieve an obstruction. ENDOSCOPIC TECHNIQUES. An endoscope is a thin flexible tube that uses a lens or mirror to look at various parts of the gastrointestinal tract. Endoscopic retrograde cholangiopancreatography (ERCP) can accurately determine the cause and site of blockage. It also has the advantage of being able to treat the cause of obstruction, by removing stones and dilating (stretching) strictures. ERCP involves the injection of x-ray dye into the bile ducts through an endoscope. Endoscopic ultrasound is another endoscopic alternative, but is not as available as ERCP and is not therapeutic. The first aim is to control the bacterial infection. Broad-spectrum antibiotics are usually used. If the infection does not come under control promptly, as noted by decrease in fever and pain, then other methods to relieve the obstruction and infection will be needed. Either way, definitive treatment of the cause of bile duct infection is the next step, and this has undergone revolutionary changes in the past decade. Endoscopic, radiographic and other techniques have made it possible to successfully remove stones and dilate strictures that previously required surgical intervention, often with high morbidity and mortality. Just as with diagnosis, treatment of cholangitis involves a number of similar procedures that differ mainly in the way the bile ducts are entered. The aims of these techniques are immediate relief of obstruction and infection as well as correction of any abnormalities that have caused them. It is important to realize that even with endoscopy, x-ray dye is injected into the ducts and therefore the radiologist plays a role in both types of procedures. When endoscopy is used, the muscle between the intestine and bile duct is widened, to allow stones to pass. This is called a sphincterotomy and is often enough to relieve any obstruction and help clear infection. The widening of the muscle is needed if other procedures involving the bile duct are going to be performed. Insertion of a catheter or thin flexible tube to drain bile and relieve obstruction. When performed by insertion of a needle into the liver the technique is called percutaneous transhepatic biliary drainage (PTBD); when performed endoscopically the catheter exits through the nose and is called a nasobiliary drain. Balloons can be inserted into the ducts with either method to dilate strictures. Insertion of a prosthesis which is a rigid or flexible tube designed to keep a narrowed area open; it is usually placed after a stricture is dilated with a balloon. Removal of stones can be accomplished most often by endoscopic techniques. A number of methods have been developed to perform this including laser and contact lithotripsy in which stones are fragmented by high-energy waves. Fortunately, with recent advances in the above methods, this is a last option. Nonetheless, about 5-10% of patients will need to undergo surgical exploration of the bile ducts. In some instances, the bile duct is so narrowed due to prior inflammation or tumor, that it needs connection to a different area of the intestinal tract to drain. This is rather complicated surgery and carries a mortality rate of 2%. Extracorporeal shock-wave lithotripsy (ESWL) was first used to break up kidney stones. The technique has been extended to the treatment of gallstones, in both the gallbladder and bile ducts. It is often combined with endoscopic procedures to ease the passage of fragmented stones, or oral medications that can dissolve the fragments. Rarely, stones are also dissolved by instilling various chemicals such as ether directly into the bile ducts. The outlook for those with cholangitis has markedly improved in the last several years due in large part to the development of the techniques described above. For those patients whose episode of infection is caused by something other than a simple stone, the future is not as bright, but still often responsive to treatment. Some patients with autoimmune disease will need liver transplantation. This involves eliminating those factors that increase the risk of infection of the bile ducts, mainly stones and strictures. If it is medically possible, patients who have their gallbladder and suffer a bout of cholangitis should undergo surgical removal of the gallbladder and removal of any stones. For other patients, a variety of therapies as outlined above, including dissolving small stones with bile acids are also available. A combination of several of these methods is needed in some patients. Patients should discuss the risks and alternatives of these treatments with their physicians. "Endoscopic Retrograde Cholangiopancreatography (ERCP)." American Society for Gastrointestinal Endoscopy. http://www.asge.org. "Gallstones." National Institute of Diabetes and Digestive and Kidney Disease. http://www.niddk.nih.gov. Kaminstein, David S. "Gallstones." A Healthy Me Page. http://www.ahealthyme.com/topic/cholangitis. "Primary Sclerosing Cholangitis." National Institute of Diabetes and Digestive and Kidney Disease. http://www.niddk.nih.gov. Worman, Howard J. "Sclerosing Cholangitis." Columbia University Health Sciences Page. http://cpmcnet.columbia.edu/dept/gi/PSC.html. "Your Digestive System and How It Works." National Institute of Diabetes and Digestive and Kidney Disease. http://www.niddk.nih.gov. Antibiotic — A medication that is designed to kill or weaken bacteria. Bilirubin — A pigment produced by the liver that is excreted in bile which causes a yellow discoloration of the skin and eyes when it accumulates in those organs. Bilirubin levels can be measured by blood tests, and are most often elevated in patients with liver disease or a blockage to bile flow. Computed tomography scan (CT scan) — A specialized x-ray procedure in which cross-sections of the area in question can be examined in detail. In evaluating the bile ducts, iodine-based dye is often injected intravenously. The procedure is of greatest value in diagnosing the complications of gallstones (such as abscesses, pancreatitis) rather than documenting the presence of a stone. Endoscope — An endoscope as used in the field of gastroenterology is a thin flexible tube which uses a lens or miniature camera to view various areas of the gastrointestinal tract. When the procedure is performed to examine certain organs such as the bile ducts or pancreas, the organs are not viewed directly, but rather indirectly through the injection of x-ray dye into the bile duct. Endoscopy — The performance of an exam using an endoscope is referred by the general term endoscopy. Diagnosis through biopsies or other means and therapeutic procedures can be done with these instruments. Extracorporeal shock-wave lithotripsy (ESWL) — This is a technique that uses high-pressure waves similar to sound waves that can be "focused" on a very small area, thereby fracturing small solid objects such as gallstones, kidney stones, etc. The small fragments can pass more easily and harmlessly into the intestine or can be dissolved with medications. Primary sclerosing cholangitis — A chronic disease in which it is believed that the immune system fails to recognize the cells that compose the bile ducts as part of the same body, and attempts to destroy them. It is not clear what exactly causes the disease, but it is frequently associated with another inflammatory disease of the digestive tract, ulcerative colitis. The inflammation of the ducts eventually produces formation of scar tissue, causing multiple areas of narrowing (strictures) that block bile flow and lead to bacterial infection. Liver transplant gives the best chance for long-term survival. Ultrasound — A non-invasive procedure based on changes in sound waves of a frequency that cannot be heard, but respond to changes in tissue composition. It requires no preparation and no radiation occurs. It has become the "gold standard" for diagnosis of stones in the gallbladder, but is less accurate in diagnosing stones in the bile ducts. Gallstones as small as 2 mm can be identified. The procedure can now also be done through an endoscope, greatly improving investigation of the bile ducts. inflammation of a bile duct. adj., adj cholangit´ic. inflammation of the bile ducts, caused either by bacterial invasion or by obstruction of the ducts by calculi or a tumor. The condition is characterized by severe right upper quadrant pain, jaundice (if an obstruction is present), and intermittent fever. Blood tests reveal an elevated level of serum bilirubin. Diagnosis is made by ultrasound evaluation and cholangiography. Treatment uses antibiotics for infection and surgery for acute obstruction. See also biliary calculus. Clinical findings Right upper quadrant pain of varying severity which may radiate to the shoulder, nausea, vomiting, constipation, episodic chills, fever, slow pulse, Murphy sign, anorexia, weight loss; spontaneous remission is rare. Lab Increased leukocytes—especially neutrophils—increased bilirubin, urobilinogen in urine. Hepatology Inflammation of a bile duct. See Acute cholangitis, Primary sclerosing cholangitis, Recurrent pyogenic cholangitis. Inflammation of the bile ducts. This is usually secondary to obstruction by gall stones so that infected material is unable to escape into the bowel. inflammation of a bile duct. a fairly well-defined entity of mature cats, sometimes associated with pancreatitis; the inflammatory portal infiltrate is largely lymphocytic; regresses after prednisolone therapy. See also cholangiohepatitis. Immunoglobulin G4-associated cholangitis mimicking cholangiocarcinoma treated by laparoscopic choledochectomy with intracorporeal Roux-en-Y hepaticojejunostomy. Recurrent cholangitis, pancreatitis and malignant alteration are major problems that require timely diagnosis and appropriate surgery. WHAT IS THE RIGHT THERAPEUTIC APPROACH TO BILIARY CHOLEDOCHAL CYST? Presentation of cases: From January 2010 to January 2015, we identified six in-patients with choledochal cysts alongside cholangitis during pregnancy. All the 3 patients with loop common hepatico-loop jejunostomy and entero-enterostomy suffered from recurrent episodes of cholangitis in the post-operative period. Cholangitis was defined by presence of high-grade fever with jaundice and acholic stools and were treated with antibiotics and supportive treatment. In acute cholangitis, the imaging findings include both biliary and parenchymal changes. 5) No abnormalities 55 (26) 320 (17) Cholangitis 9 (4. 8,9) Here we report a case of a 67-year-old woman who presented with acute cholangitis and three living F hepatica removed with basket via Endoscopic Retrograde Cholangiopancreatography (ERCP). Primary biliary cirrhosis is an organ-specific autoimmune disease of the liver characterized by the presence of serum anti-mitochondrial antibodies (AMAs) and chronic nonsuppurative destructive cholangitis involving small-sized and medium-sized bile ducts with progressive fibrosis, leading to cirrhosis. Results: Two patients (8%) presented with a bile leak 3 (12%) with a wound infection and 2 (8%) pati-ents with cholangitis. Elena was diagnosed with the liver condition primary sclerosing cholangitis at the age of 19. The management of PB is complex in patients who present with variceal bleeding and clinically significant biliary obstruction, especially when the case is further complicated by biliary stones and cholangitis.